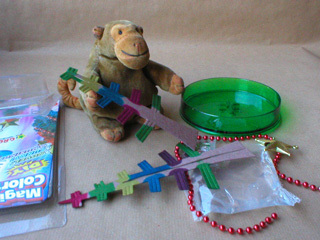 In the shop at the Laing gallery in Newcastle, Mr Monkey found a plastic package which claimed to have everything that he'd need to grow his own Christmas tree. Always keen to experiment, he immediately added it to the things his humans were buying, and looked forward to some festive horticulture. When he got home, Mr Monkey found a safe place to grow his new tree. He was a little puzzled to find out that it was mainly made out of cardboard and a small sachet of something called 'Magic Water'. 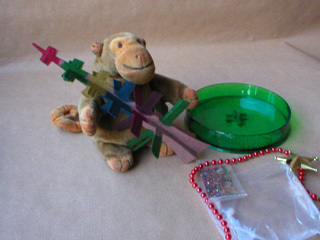 Mr Monkey suspected that the 'Magic Water' was actually a chemical. 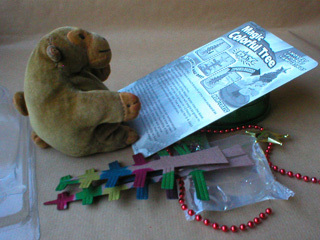 There was also string of beads, a packet of glitter, and a gold-effect star to decorate the tree with. He read the instructions carefully before starting to make his tree. 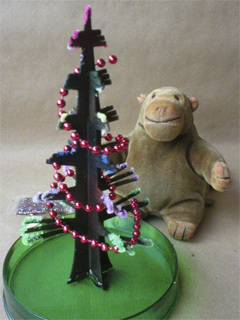 Mr Monkey slotted the two parts of the tree together, then very carefully bent the branches in different directions to make it look a little less as if the tree was just two flat sheets of cardboard. 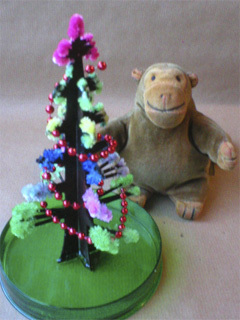 When he'd spread the branches as much as he thought he could risk without breaking them off, Mr Monkey carefully fitted the tree into the green plastic tree holder. Then he draped the rope of tiny baubles around the tree. 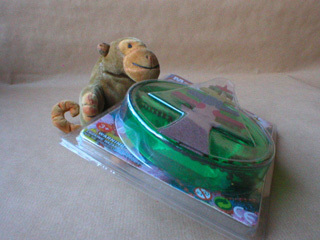 Next, Mr Monkey poured the 'Magic Water' into the plastic dish. Mr Monkey was fairly sure that the magic water, far from being a mystical liquid concocted by a mighty wizard, was actually a saturated solution made from water, ammonia, laundry bluing and salt. But he could be wrong. 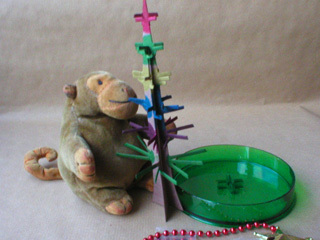 Mr Monkey stared hard at his Christmas tree as it sat in its bath of saturated solution. 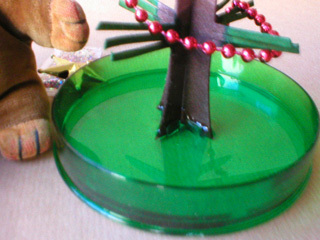 Very quickly, capillary action sent the liquid up the tree. At the same time, all the branches that Mr Monkey had carefully spread did their best to unspread themselves. 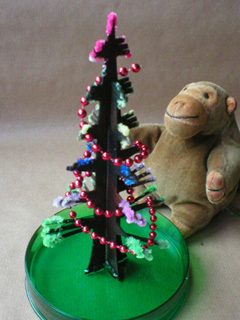 After about an hour Mr Monkey spotted the very first signs of growth on his tree. If he'd been wearing a scientist's white coat, he'd have said that evaporation was causing crystals to nucleate, but he wasn't. That didn't stop the crystals nucleating, though. You can read about this process at University of Cambridge website or download a pdf about growing crystal trees at the David A. Katz website. 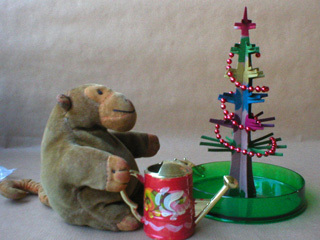 Once he'd planted and watered the cardboard tree, there wasn't much for Mr Monkey to do but wait. 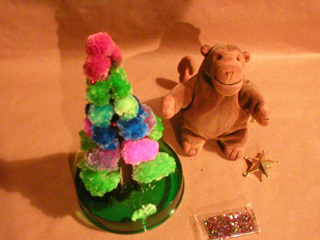 Every so often he inspected the tree to see how the crystals were growing; the pictures above show the tree 2, 2½, and 3½ hours after Mr Monkey poured the chemical onto the cardboard. 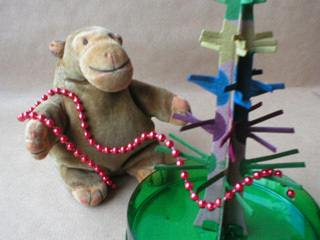 After the tree had been growing for almost six hours, Mr Monkey studied it again. He noted that there was a lot less liquid in the dish than before, and that the colour of the crystals depended on the colour of the branch they were growing on. 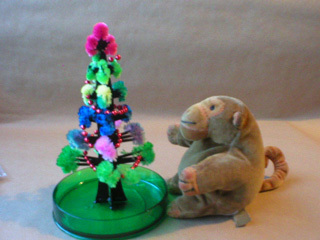 Before going to bed, when it was so dark Mr Monkey's humans had to switch the lights on, Mr Monkey inspected the 14½ hours growth of his crystal tree. 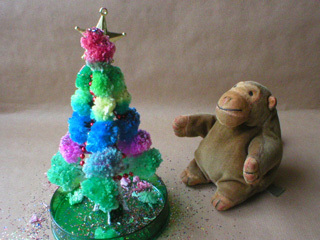 He noticed that the tree was much more bushy than before, and that the colours were more varied than before. 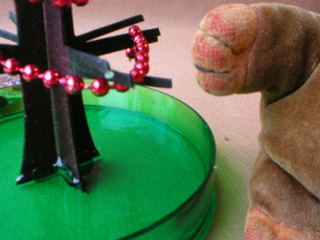 He also noticed that some crystals had fallen off the tree while his attention had been elsewhere. Next morning, Mr Monkey scampered downstairs to finish off his tree, which was now a little over 24 hours old. 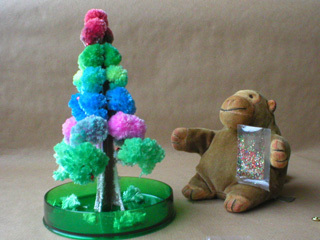 He carefully snipped the end of the packet of glitter, and hurled the glitter in the general direction of the tree. Some of it landed on the tree, and a lot of it didn't. Finally, all there was left to do was fix the gold star to the top of the tree, and to find someone to clear away all the glitter which had avoided the tree.